– Before every third and 10 situation Tyrod Taylor faces, request a measurement. – Hold a holiday craft fair inside Patriot’s Injury Protocol tent. – Switch Belichick’s challenge flag with a penalty flag and then wait for the hilarity to begin. – Pay the Patriot’s bus driver to lie that a new NFL law mandates that all visiting teams, before arriving at New Era Field, must pay homage to Roger Goodell by seeing where he grew up in Jamestown. – Before gaining access to visiting team’s locker room require Belichick to pay a $500 security deposit. ï Cause at least a 10-minute delay after every Bills choreographed touchdown celebration in order to clear the field of floats, confetti, and white doves. – During halftime, position Christmas carolers outside Patriots locker room. – Claim they donated the Patriot’s Injury Protocol tent to Toys for Tots forcing them to use a makeshift blanket fort consisting of two sofas and a flannel sheet. – Hire a Salvation Army bell ringer to stand next to Patriot’s Gatorade table. – Claim it’s common for them to allow the guy who dresses as Elvis access to the visiting team’s bathroom. 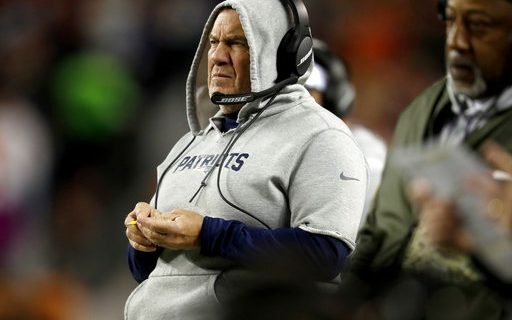 – Have Woody sneak into Pats locker room overnight and re-attach the sleeves to his hoodie.